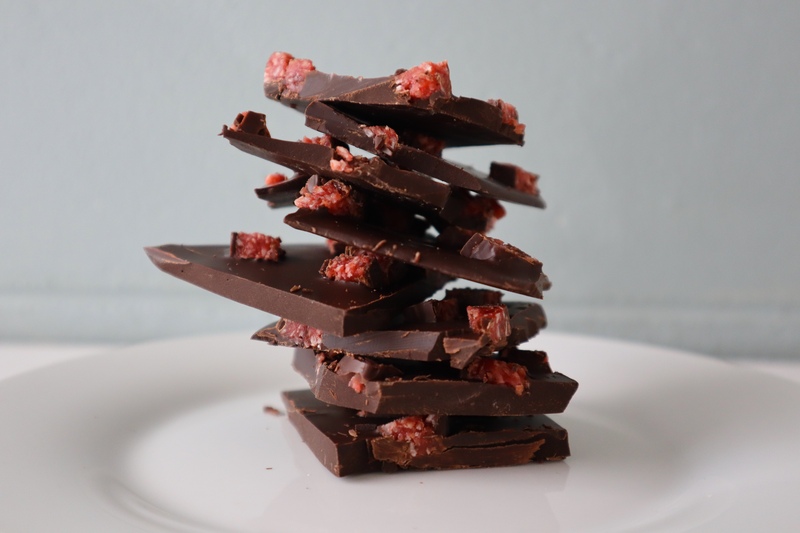 Chocolate bark is so delicious, very simple to make and uses minimal ingredients. There are so many toppings you can try, this is one of our favourites – sweet cherry, coconut and dark chocolate make a delicious combination. Melt chocolate in a metal bowl over a saucepan of simmering water. Once fully melted spoon the chocolate on to a sheet of baking paper on a flat tray and using a spatula spread out until the bark is about half a centimetre thick. While the chocolate is still soft top with chopped Cherry Ripe bar. Place in fridge for 1-2 hours until the chocolate is fully set. Once set, chop in to 3 x 3 inch pieces. Enjoy! *Cherry Ripe bars are Australia’s oldest chocolate bar, they are a delicious mix of cherry and coconut smothered in dark chocolate. They can be purchased online however if you can’t get a hold of one you can use dried cherries and coconut flakes which will also work great for this recipe. Love bark? Click here for our Pretzel and Peanut Chocolate Bark and here for our Dark Chocolate, Pistachio, Almond and Sea Salt Bark recipe. Thank you – how good is chocolate! Yum! Will definitely have to make these.